Softcover, 8 1/4 in. x 10 in. Jeremy Walton's BMW 3 Series Enthusiast's Companion is the only book you'll ever need about BMW's most popular line. It discusses the roots of the 3'er in the Neu Klasse and 2002, as well as renditions of the series itself, including E21, E30, E36 and the latest E46. Various body styles and engines are represented, as are the many variations needed for BMW's diverse markets world-wide. Walton takes you from the inspirational 2002 through the early phases of development of the first of the 3 Series. Although he provides in depth coverage of the 320i that came to North America, extensive information is provided about the 316, 320 and 323i which made such an impact in Europe. Although Americans experienced lackluster performance from their Seventies 320i models, Walton extensively delves into the many competition successes of this and subsequent 3'ers, all of which are studied at length in their many guises. This Enthusiast's Companion tells you how to identify the various models and helps you to decide which engines, bodies, models and years are best suited to your needs. Do you want the high-revving edginess of the E30 M3, or would you be better suited by an almost equally quick, but less peaky, E36 model 328is? 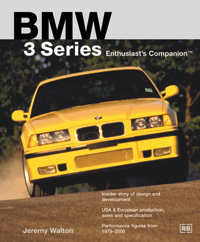 Every page of every chapter of this book is intended to help you to better understand and enhance the enjoyment of your 3 Series BMW.